I recently received an email from a reader who asked the question seen in the title above. Well, I’ve been a fan of Steven Raichlen, barbecue guru, for some time now. My wife and I watch two of his shows; Primal Grill and Barbecue University, religiously and make sure we set up our DVR to save the programs when we are not available to watch them live. We even love to watch the reruns because there is always something to learn, even if you’ve watched it the first time, from this master of all things grilling and barbecue. One concept that he discusses is using a mop sauce and he answers the question as to the benefits of using a BBQ sauce mop with following three responses. 1. 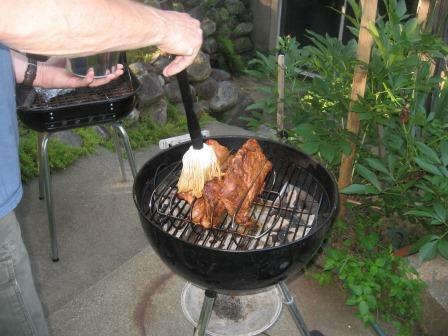 It adds an extra level of flavor to the food that you are grilling or barbecuing. 2. It adds an extra amount of moisture to the food. 3. It gives you something cool to do while you are waiting for your food to finish cooking. 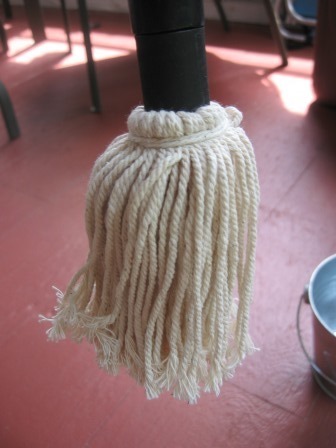 Well, that was all I needed to hear and decided to invest in his Best of Barbecue Sauce Mop and Bucket. 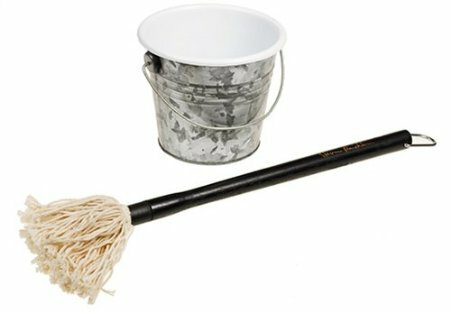 Don’t get me wrong, you can apply your mop sauce with any basting brush that you have around the house and you can simply use a metal pan to hold the mop sauce. But, to be honest, I love my grilling and barbecue paraphernalia (you can read about a lot of them here) and most of the items that I purchase instill within me an added vigor to get out to the smoker or kettle grill to make it happen! Also, most of these items are fairly reasonable in cost so I make it a point to buy top quality items because I want them to last a good long time. Steven Raichlen’s Best of Barbecue product line fits that high quality description as well as any of my Weber charcoal grill accessories. 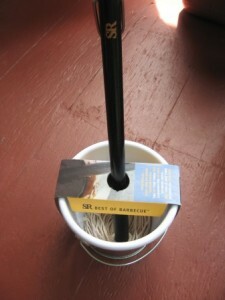 The images above are of me using my Best of Barbecue Mop and bucket when I am grilling some baby back ribs with my Weber Rib Rack. 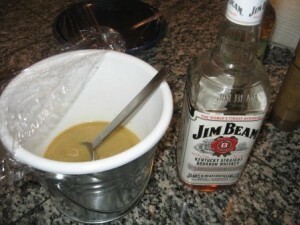 There is also an image of the BBQ mop sauce which includes the bourbon next to it as one of the ingredients. You can search Steven Raichlen's Barbecue University site for a mop sauce of your choice. So, if you are one who follows the advice of masters, Steven Raichlen is certainly one of them. By the way, a mop sauce can not only be used on ribs but on any meat, seafood, or vegetables that you are grilling. You can use a basting brush and pan but our ribs came out delectable and I certainly feel that my Steven Raichlen Best of Barbecue Mop and Bucket certainly was a big factor in the awesome outcome! If you'd like to see some more images of using my BBQ sauce mop and bucket check out this article on how to barbecue a whole chicken. Please remember that you can always get in touch with me using my Contact Me page or just leave a question in the comments! ut libero non felis amet, odio diam risus.